Volkswagen Truck & Bus forges ahead in digital transformation of the transport eco-system by going live with the RIO platform. Open, cloud-based RIO platform and free starter service RIO Essentials available as of now. 340,000 connected MAN and Scania trucks offer great potential for digital services. With the market launch of its digital brand RIO, Volkswagen Truck & Bus is pressing on with the implementation of its digital strategy. From now on customers can register on the RIO platform and use the first available service, RIO Essentials, free of charge. “The going live of RIO is a path-breaking step in the implementation of our digital strategy. With RIO, Volkswagen Truck & Bus will make the world of transport more efficient and more transparent. That is why the cloud-based RIO platform is open for other brands and for new partners. Our industry is undergoing a fundamental change, and we will be actively shaping this transformation,” said Andreas Renschler, CEO of Volkswagen Truck & Bus and the Volkswagen AG Board Member responsible for commercial vehicles. Through digitization and connectivity, transport and logistics are being made more efficient and the transport flow is optimized. This will help to improve the sustainability of the growing volume of goods transport. This is where RIO comes in: for every vehicle registered, RIO Essentials supplies precise information round the clock on mileage, fuel levels, and driver identification, as well as an extensive performance analysis. The RIO Essentials services can be accessed not only by MAN vehicles with RIO Box, but also by other vehicles with RIO Box, regardless of system and vehicle manufacturer. From January 2018 onwards the RIO Box can be retrofitted in all vehicles with FMS interface. This will make RIO especially suitable for fleets with vehicles of different brands. Since August 2017 every MAN truck delivered in Europe has had the RIO Box with access to the RIO platform as a standard feature. The Scania, Volkswagen Caminhões e Ônibus, Volkswagen Commercial Vehicles brands and the strategic partner Navistar will in future also be using the RIO platform – with a potential of more than 650,000 networked vehicles worldwide. RIO will be launched initially in German and English, but in future ten languages will be available, including French, Italian, Dutch, Polish, and Spanish. 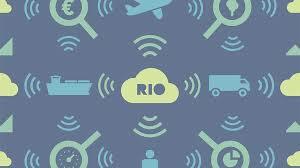 RIO is thus paving the way to a networked supply chain that will make transport and logistics more efficient for customers and consumers. RIO is planning to expand its service portfolio continually in order to offer its customers the right solutions to deal with the rising demands.